Do you want to apply for Ghana Biometric Birth Certificate? In this guide, you’ll learn all the procedures involved in applying for Ghana Biometric Birth Certificate Online. When and if you are applying for a Ghanaian passport, you’ll definitely need a birth certificate. Without it, you can’t apply for your passport. You can either apply for Ghana birth certificate online or offline. If you have gone through our guide on how to get a Ghanaian Biometric Passport in 15 days, then you should also read this guide on how to get a Ghanaian birth certificate. So, below is a step by step process on how to get a Ghana birth certificate online. Why do You Need a Ghana Birth Certificate? How to Apply for a Ghanaian Birth Certificate Online. According to VitalCheck, a certified birth certificate is an official government-issued record of a person’s birth, printed on security paper and includes an official raised, embossed, impressed or multicoloured seal. Here in Ghana, the Births and Deaths Registry was established by the Act 301 of 1965, within the Ministry of Local Government and Rural Development, to handle and develop the births and deaths registration system in Ghana. However, the Registration of Births and Deaths Act of 1965, (Act 301) is the legislation currently in force in the country. 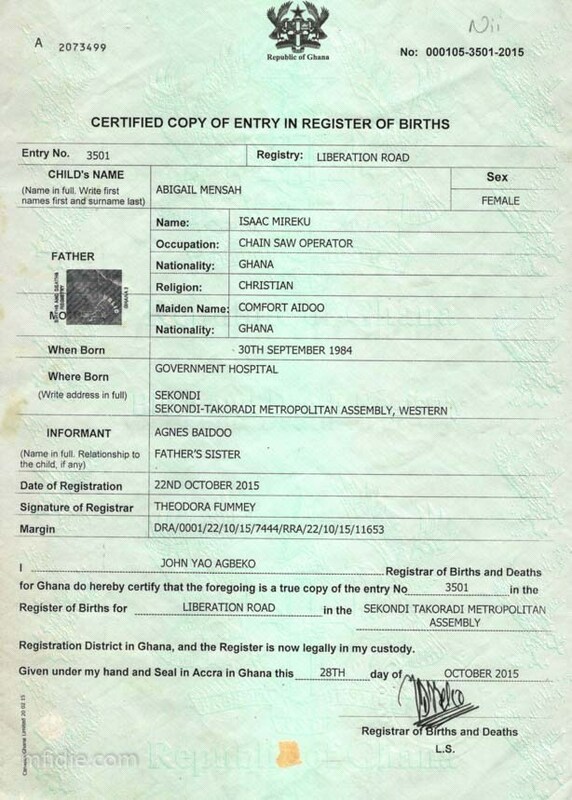 There are many reasons why you should get a birth certificate in Ghana. Below are some of the reasons why you need a birth certificate. 1. Identification – Your birth certificate is your first form of identification. It verifies your name and correct spellings. 2. Registration in a school – You need a birth certificate to be enrolled in a school in Ghana. It is a very vital document required during the school admission process. 3. Obtaining a passport – You need a birth certificate to apply for a passport. Without it, you cannot process your passport application in Ghana. 4. Proof of age – as a birth certificate identifies the date on which a person was born, it indicates a person’s correct age which is sometimes necessary for certain jobs with age requirements. 5. Proving citizenship – Your birth certificate is also documentary evidence of citizenship or residency in Ghana. 6. Opening a bank account – most banks require two forms of identification, with a birth certificate being the primary piece of identification. Additional pieces of identification include an identification card or drivers permit. 7. Receiving insurance benefits – some health insurance companies require proof of relation to dependents for coverage. For example, to prove relation to a child in such an instance, a Government-issued birth certificate is an acceptable form of identification. 8. Obtaining a Driver’s License – You may need a birth certificate to obtain a drivers license. You may also want to talk with someone at the department of driver services first, but it never hurts to bring along the certificate as proof even if it is not required. Below is a step by step procedures to apply for a Ghanaian birth certificate online. On the top-left side of the eServices Page Click on BDR – Apply for Birth Certificate. Next, visit eServices website again and click on Apply for Birth Certificate or BDR tab. Carefully fill the forms and Upload Required files you have already scanned. Payment options will be made available to you before the entire process can be completed. Use myghpay by GT Bank to make payment on the e-payment platform. You might want to ask, what is the cost of the Ghanaian biometric birth certificate. It costs GHS 50 to apply for the Ghanaian Biometric Birth Certificate online. Once your application is completer, your birth certificate will be ready for collection after 14 working days. For any question concerning the Ghana biometric birth certificate, please use the comment section below. For the manual application process, visit your local district office.